NEWS! 報名資訊公開! Registration info published! Please note that the special room prices listed below will be only available from 2019. 01. 01 to 2019. 08. 31 After the promotional period, the prices will return to the original, undiscounted prices. Fill out the hotel reservation PDF form during the opening period, then email the file to [email protected] with the subject of "Infurnity 2019 Room Reservation(Your name here)". Please prepay 30% deposit of the room price within 15 days after booking. 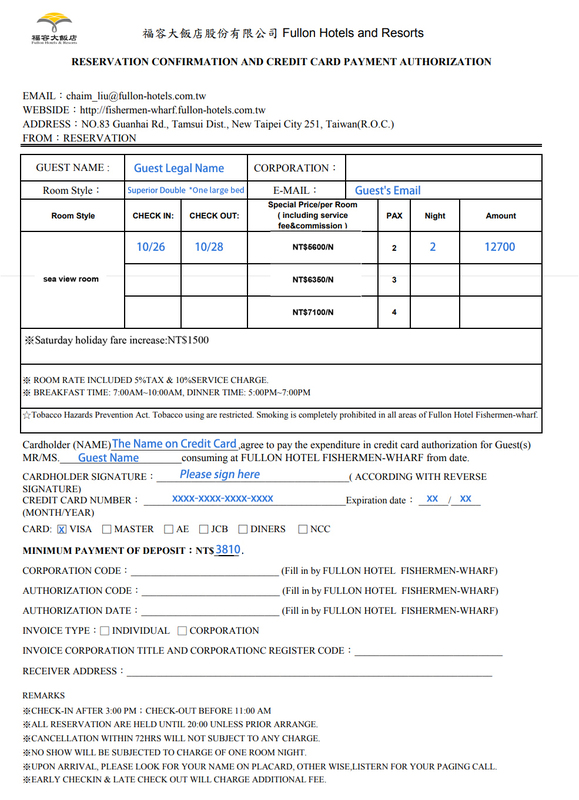 If the payment is not made according to the hotel reservation deposit policy, the hotel reserves the right to cancel the room reservation without prior notice. After the reservation process is completed, the hotel will inform you about the status of your reservation within two weeks. Please wait patiently due to the manual work process. Please be aware that the special room prices are only available through EMAIL reservation. Reservation through phone or any third party method cannot apply for the discount. Only credit card is accepted. Please prepay 30% deposit of the room price within 15 days of booking. The remaining amount should be settled on the day of check-in. The Double room with one large bed is also available for reservation in limited numbers. Please note your preference in the remark column when booking the double room. Check-­in any time after 15:00; check-­out by 11:00. Room guests are free to use the facilities in the hotel such as sauna, hot spring pool, fitness center, Lih SPA, outdoor swimming pool, wi-fi and parking. A paid hotel shuttle bus service is available to attendees who reserved a room. For more information, please read the guide on the travel info page. Any additional charges (for additional beds, room meal services, phone bills, etc.) incurring during the stay in the hotel should be paid during check-out. Guests should pay attention to and abide by the hotel regulations when using the facilities. If any damage (intentionally or through negligence) is done to the hotel facilities, all parties involved are jointly liable for the damages. Cancellation before 2019/10/11 will be accepted and return the full deposit. Cancellation before 2019/10/18 will be accepted and return 50% of the deposit. Cancellation before 2019/10/22 will be accepted and return 30% of the deposit. Cancellation during 2019/10/23 to 10/27 will not be accepted and cannot be refunded. If the guests encounter any natural disaster such as a typhoon or earthquake either at the hotel or their point of departure during the reservation period and are unable to check-in, please contact the hotel and the clerks will help you with the the room cancellation or booking adjustment. The adjustment of the check-in date shall be within 3 months from the former date of stay and shall be limited to one of the available rooms. If you have any other question regarding room reservation, please contact us via Email, Twitter or FaceBook. ► The Double room with one large bed is also available for reservation in limited numbers. Please note your preference in the remark column when booking the double room. ► Room guests are free to use the facilities in the hotel such as sauna, hot spring pool, fitness center, Lih SPA, outdoor swimming pool, wi-fi and parking. ► Paid hotel shuttle bus service is available to attendees who reserved a room. For more information, please read the guide on the travel info page. Copyright 2015-2019 Infurnity Taiwan Furry Convention Website built by J.C. , Shu and AllanCat.